“The Hobbit is humorous and original; and packed from cover to cover with hair-raising thrills and magic,” says Olive Roberts Barton. Do you think she had any idea, now on the 75th anniversary of the book, that it would be turned into one of the most anticipated feature films of all-time? Do you agree with Barton’s take? There has been uproar from some people about the hinted Gandalf-Galadriel romance in the Hobbit trailers and pictures. Is this a case of a studio looking to cash in on the sentimental crowd (a la, playing up the Aragorn-Arwen dynamic in LOTR), or could a legitimate case be found for it in Tolkien’s writings? When I first watched the trailer I was also confused. After some thinking -granted Im probably the largest LOTR fanboy and within 100 miles- I realized the trailer was still epic and that nothing Peter did was out of line. Today I venture to say the Galadriel-Gandalf scene is perfectly justified. Jackson had [at least I think] more in mind than appealing to a specific demographic. Brace yourself, Im about the throw a bunch of Elvish words at you. Gandalf, as we all know, is a wizard belonging to the Order of Istari, a group that also includes Saruman, Radagast, and the Blue Wizards Allatar and Pallando whom we don’t really hear about. What’s important about this fact is that the Istari were maiar. Many people like to call the maiar “demi-gods.” Others like to think of them as angels. In either case, they are defined by J.R.R. Tolkien as “Holy Spirits” that took part in the creation of the world. That’s right, Gandalf took part in the creation of Middle-Earth. He’s tremendously awesome and powerful. The five maiar were sent by the Valar (Greater Holy Spirits) to aid the men of Middle-Earth in the coming fight against Sauron. They arrived in Middle-Earth in the form of old men early in the Third Age, about 2,000 years before the Hobbit Epic begins. There is no reason to believe that Gandalf (known back then as Olorin) did not meet Galadriel, or that they did not develop a acquaintanceship, friendship, or even semi-romantic relationship- she wouldn’t meet Celeborn for more than a millennium. What I underlined in the text above is incredibly important. Gandalf actually ages very slowly. He’s in the form of an old man not because of his actual age, but because that was the form he and the other Istari took up in order to appear more wise and trustworthy to the men of Middle-Earth. When Gandalf arrived in Middle Earth much much later, Tolkien indicates that Galadriel trusted him more than the other Istari. She thought he should be head of the order over Saruman. For a reason beyond sheer instinct? The proposition seems plausible. Wow … what an amazing case. Consider us sold! What do you think? As USA Today reports, we now celebrate the 75th anniversary of J.R.R. Tolkien’s The Hobbit. It’s amazing to think about what a landmark 3/4 century it’s been. Middle Earth spawned from the mind of one Oxford professor, and now it’s a part of the global consciousness. Look at what one person’s ideas can do for the world…what one small hobbit can accomplish against forces far beyond his control and in places he’s never known. No need to wait for Peter Jackson and his movie The Hobbit: An Unexpected Journey to arrive on Dec. 14: Middle-earth mania has already hit bookstores. Friday marks the 75th anniversary of the publication of J.R.R. Tolkien’s immortal tale about the great adventure of furry-footed Bilbo Baggins. Written by Tolkien, a British professor, for his four children and published in 1937 with a 1,500-copy first printing, it’s the story of how a stay-at-home hobbit very fond of hearth and home ends up venturing forth with 13 dwarves and a wizard named Gandalf to retrieve treasure stolen by a savage dragon. The prelude to The Lord of the Rings trilogy, The Hobbit has been translated in to more than 50 languages and has sold 100 million copies worldwide. “These books have spawned thousands of fantasy novels and inspired hundreds of writers in the years since, but it’s important to note that it all began 75 years ago with the opening line of a book, ‘In a hole in the ground there lived a Hobbit,’ ” notes Gary Gentel, president of Houghton Mifflin Harcourt trade division, in an e-mail. The International Congress on Medieval Studies will be celebrating it’s 47th year this year in Kalamazoo, MI. The conference takes place May 10-13, and features many lectures, panels, and scholarly discussions on medieval topics. There are many sessions on Tolkien or related topics this year including Tolkien’s poetry, songs, and theology. If you are interested in attending this year, you have to register at the WMU site, where you can find the full conference schedule. You can view the Tolkien-related sessions here, compiled by TheOneRing.Net. Please be aware this is a scholarly event. And, being a Michigan native from the area, I highly recommend taking a trip over to Bilbo’s Pizza in a Pan if you go! The wonderful thing about classic stories like The Hobbit and Lord of the Rings is that it seems to bring forth amazing images brought on by the heightened imaginations of its fans. I am truly in awe of those who are able to transpose the thoughts in their heads out onto paper, canvas, and even screen. As we look forward to seeing another epic story from the mind of JRR Tolkien through Peter Jackson, I am interested in seeing how he brings to life the scene in which Esgaroth (aka Lake Town) is attacked by Smaug. Knowing that Jackson opted to skip on The Scouring of the Shire in the Return of the King, which disappointed many, it was still an enormously successful movie so much that it won the Best Picture title at the Academy Awards, it would not be the same if he were to do that with The Hobbit in regards to this attack. Obviously, a major story plot would have to be changed in order to do that, and we know that’s not going to happen! We will have to wait and see how it will translate on film, and I’m not sure whether that will be in the first or second film. 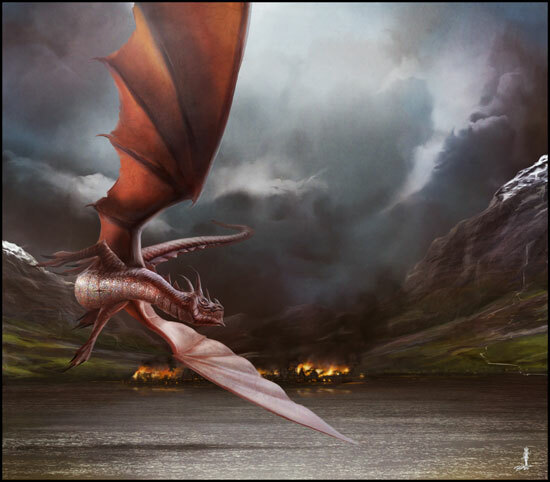 For now, let us sate our appetite with these amazing pieces of fan art of Smaug and Esgaroth. Even the artist himself stated that the town looks to be surrounded by two mountains instead of just The Lonely Mountain, however, what’s really nice about this image is how the jewels on Smaug’s belly are depicted. Go here for the enlarged version of the image, which will direct you to wildlifehoodoo’s DeviantART page. I love the background of this rendition, especially the Lonely Mountain. It looks so majestic, yet slightly haunting, making it very alluring for a creature as big as Smaug to want to make it his home. For the larger version, click here to go to Gaiu31duke’s DeviantART page. The Lonely Mountain can be seen on the background and Lake Town is the focal point here. The colors and imagery looks like it could actually be a scene from Peter Jackson’s film. You could almost mistake it for any regular landscape, save for the fact that when you observe it more, you can see Smaug just about to fly over the town, almost as if he were about to silently pass by. For the larger version, click here to go to n8package’s DeviantART page.